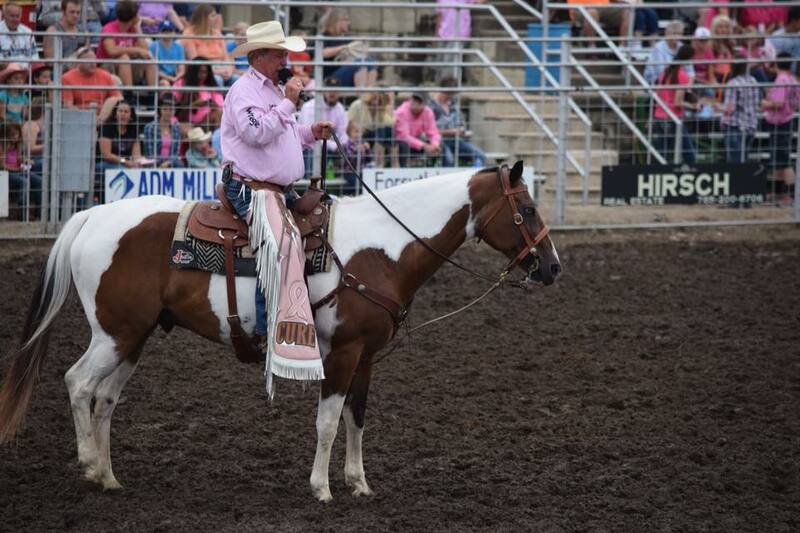 Nominated One of the TOP 5 Rodeo Announcers of the Year for 2016, Mike Mathis – announcer for the Wild Bill Hickok Rodeo joins us for the 11th year in 2018! Mike Mathis wasn’t supposed to be in the rodeo business. As a Texan, it would have been natural to be a cowboy and he even dabbled at competing in bull riding while in high school. Nevertheless, Mathis grew up grooming himself for a very different kind of life. After high school he thought he wanted to be a military pilot and even started the Navy training during the Vietnam era, however asthma altered those plans. A natural aptitude for finances and mathematics soon steered him into banking and business administration at Stephen F. Austin University where he earned a bachelor’s degree in management and finance. The next step was an MBA degree in finance from Southern Methodist University. But something was missing. After college Mathis got a job in the banking world in his hometown of Lufkin, Texas. Soon he was Executive Vice President of the Lufkin National Bank. When he joined the Lions Club in Lufkin the hierarchy saw in him great potential for taking over the management of their annual benefit rodeo. Soon he was the Rodeo Chairman, a position he has held for almost twenty years. Little did they know at the time but they had rekindled a passion for rodeo that would turn out to be a great loss for the Lufkin banking establishment but a huge gain for their local rodeo and even the world of professional rodeo. During the late 1970s Mike worked hard to build the Lufkin rodeo, which benefits the Angelina Burn Center in Lufkin. Born with a gift for public speaking Mathis excelled at selling sponsors, building promotions, motivating the Lions Club members and doing radio interviews and announcements during the rodeo. 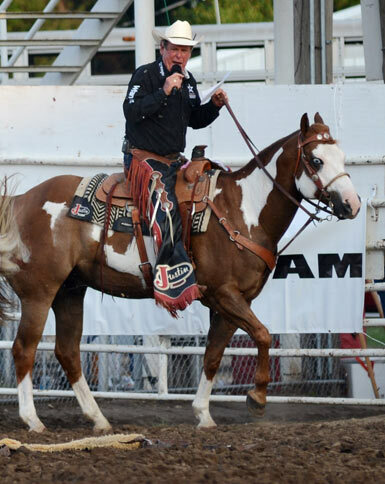 He was so good that he decided to try his hand at announcing rodeos. Starting with a few jobs in amateur rodeo in Texas, by 1983 Mathis had a solid reputation for entertaining a crowd and earned his Professional Rodeo Cowboys Association contract card allowing him to announce professional rodeos. For the next several years he wore two hats-one as an investment banker and the other a cowboy hat announcing rodeos. With encouragement from others in the business, in 1989 Mathis quit the bank for good to pursue his dream of being a full time professional rodeo announcer. Since that time, he has announced rodeos from New York to California and from Florida to his home state of Texas. In fact, the list of rodeos he has repeatedly been selected to announce are some of the top in the business. They include five times the Professional Bull Riders Finals in Las Vegas, the National Finals Rodeo in Las Vegas, the American Quarter Horse Association World Championship in Oklahoma City, the Mesquite Texas Rodeo, the Texas Circuit Finals in Waco, the Dixie National in Jackson Miss., The Dodge National Circuit Finals in Pocatello, Idaho and most recently, the inaugural Wrangler Tour Copenhagen Cup Finals in Las Vegas. Working over 45 weekends a year, Mathis’ travel and work schedule could hardly be likened to banking hours and would kill an average man. Whether he is behind the microphone at a rodeo event or speaking to a civic group, Mathis can tell a story or convince a crowd of the importance of the thrilling match up between a great bull and the bull rider. He also has the uncanny ability to remember names, colorful stories about contestants and of course all the necessary statistics that make rodeo announcing entertaining, informative and colorful. Today, Mathis’ unique style, voice and talents are renowned in the rodeo business and of course in big demand. With rodeo experience that spans the entire arena as a competitor, committee chairman and as a in-arena showman, his insight into rodeos’ sporting/entertainment world give him the unique ability to excite and entertain the most seasoned rodeo veteran or the first time rodeo attendee.